About the User: this project was commissioned by a client who manufacturers and distributes high volumes of custom-built and branded shelters, tents, banners, flags, umbrellas, etc. Based in the United States, they distribute products world-wide using QuoteWerks to generate quotes for their customers. Redirecting the end customer to the payment page as soon as they accept the order on QuoteValet. 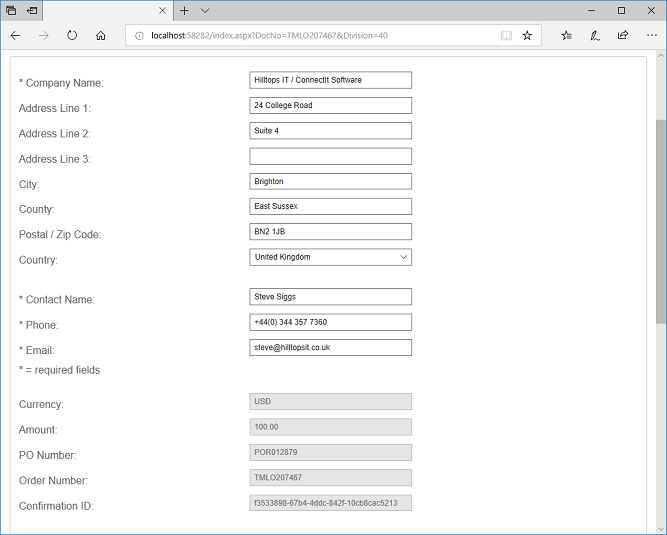 Retrieving top-line information regarding the customer order from the QuoteWerks database and presenting this on a web page for the customer to then enter their credit or debit card details to make payment. Online payment through the ChargeLogic gateway. Writing payment details to the QuoteWerks database. Secure online payment processing via the ChargeLogic service. Minimising time between order placement and deposit payment to optimise the movement of the order into production. Minimising the need for internal order processing staff to chase and process payments. Efficiently bringing all payments together through the ChargeLogic & Microsoft Dynamics NAV integration.